He'd had one college head coaching job and did well, guiding a remote program to a turnaround. Then he got his first NBA head coaching job well past age 40, coming in as an early season replacement with a losing team with most of its top players out injured and on the way to the draft lottery. And then the San Antonio Spurs under rookie coach Gregg Popovich lost 47 of their last 64 games and finished the season with the third poorest record in the NBA. And won the lucky ball in the NBA lottery and were able to draft Tim Duncan. Five NBA championships later, Popovich is the fourth winningest coach in NBA history and the Spurs and Popovich are NBA history. No one is suggesting that Bulls coach Jim Boylen is on the same path. But Saturday he returned to San Antonio, where he was an assistant on the 2014 Spurs title team and one of the branches on the formidable Popovich coaching tree. "The main thing is to establish what you want to carry over for the following year," said Popovich, who took over a 3-15 Spurs team in 1996. "You obviously can't do everything because everybody is not there. But you do what you can to establish standards and the basics of what you think the building blocks will be for offense and defense of that group. Then you go with it. "It's always difficult," Popovich acknowledged about an in-season start. "(It) is a rare difficult situation to be in. But like I always tell my players, if those sorts of things are the worse things you go through, your life is going to be pretty easy; it's basketball. So get over it. "We've had quite a few people go through managerially and coaching wise, but you have to be happy for people who move on to improve their situations and take on new jobs," said Popovich before the Bulls played the Spurs. "It's actually a thrill for us. We keep in touch with everybody because it's fun because when we go on the road there's always somebody in the film room on the court or in management who we are familiar with and it just makes it a huge family. So I really do enjoy it." Boylen went to the Spurs after assistant positions with Houston, Golden State and Milwaukee as well as four years with the U. of Utah. Boylen then went to the Pacers' staff before joining the Spurs in 2013. "We have spoken, but I don't counsel him," said Popovich. "He doesn't need my counsel. He's been coaching a long time and he knows what it takes to win. He knows how to put a program together. It's always tough to take over a program without a training camp and do everything you want to do. But he's a pretty straightforward, honest individual and he'll do it the way he thinks is best for that group. He'll be fair, he'll be demanding and he will try to make everything clear. So whatever system he wants to employ will get across. I've learned as much from him as he's learned from us here. "Everyone on my staff does everything," Popovich added. "We don't have, ‘This guy is offense, this guy is defense, this guy does that.' We all coach every day, we all participate in making offensive and defensive decisions. And during the games everybody talks to me about offense and defense; there are no specific roles. The whole gamut is available to each assistant to drive me crazy." Popovich said he didn't know Boylen before hiring him. 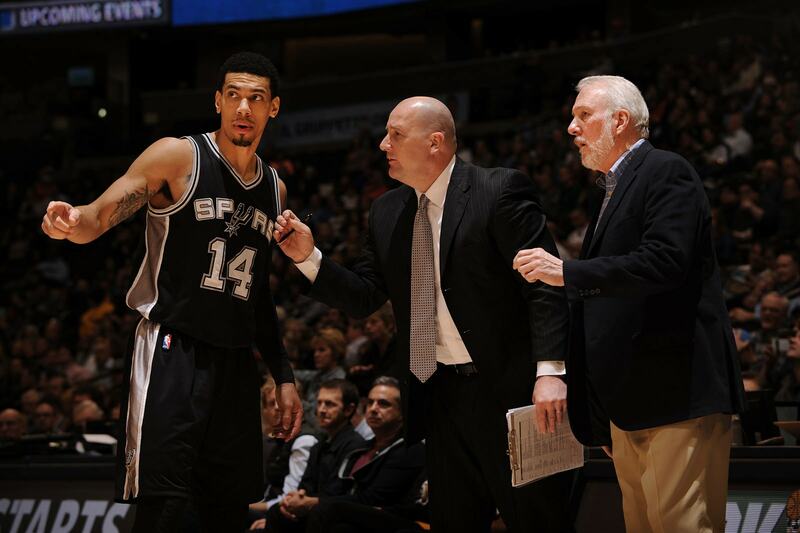 "I didn't know him personally, but some of my assistant coaches knew him," said Popovich. "Some of the guys in management had watched (him) because obviously (his) college players and that sort of thing and we liked his toughness, his sense of humor. His knowledge of the game was readily apparent. We were happy to be able to add him to the staff."